It's the middle of the night and your baby is clutching her ear and screaming. It could be her teeth, or it could be yet another ear infection. There's no way to know. In the past you would have had to wait until morning to call the doctor and bring your child in so they could get a quick look at your child's ears. Now all you have to do is grab your very own EarCheck and you'll instantly know if you really do need to go in and risk exposing your child to all the other germs lurking in the waiting room. 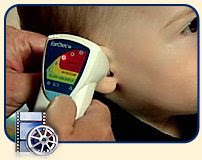 Modeled on a tool used by pediatricians all over the country, EarCheck simply, quickly, painlessly, and effectively monitors the amount of fluid located behind your child's ear drum. If it detects fluid - indication that there might be an infection - EarCheck will tell you to contact your doctor. Now, I know that winter is clearing out and hopefully taking with it it's pesky germs and viruses. But it will be back and if your kids are anything like mine, the arrival of summer means the arrival of summer germs and viruses. So don't wait until the fall to get your hands on one of these. You won't regret having it in your medicine cabinet! - I've tested this out on my own ears. It's quick and painless, really. - Small and portable. 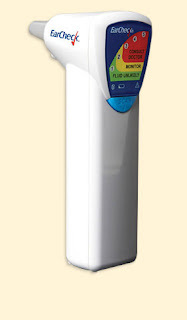 This is no bigger than an ear thermometer, and a ton more accurate! - Last time I took my child in to have her ears checked for signs of an infection they used the same monitor. 'Nuf said. - Affordable! The EarCheck retails for $49.95 (see below for a discount code!) and will save you hundreds in co-pays or doctor's bills. - Has magical properties. Ever since we got this in the mail both children have been ear infection free. OK. Might not really be magical, but I'll take what I can get. - I'm sorry, but I can't find any. And you all know how hard I usually try. This little tool will save you money, give you peace of mind, and help you care for your children more effectively. I can't think of anything bad about it! Can't wait? Use the discount code TWEET20 for a 20% discount if you buy your EarCheck on the EarCheck site. Win your very own EarCheck! 1) Leave a comment telling me about a time you weren't sure if your child had an ear infection. 2)Tell me about a time you took what turned out to be a healthy child to the pediatrician's and came home with a sick kid. 3) Visit the EarCheck website and tell us about something you learned about ear infections. 4) Subscribe to this blog's feed. Leave a comment telling me you subscribed. 5) Subscribe to my other blog's feed. Leave a comment telling me you subscribed. 6) Tweet, email, blog about this giveaway. That's a grand total of 8 ways you can enter! Please remember to leave me a way to contact you. And please, please, please, leave a separate comment for each of your entries. I can't credit you for each of them if you don't. Giveaway ends Tuesday, May 19, 2009 at 10pm PST. Contest only open to US residents. Sorry! This giveaway is now closed, but please check out other giveaways currently running. I received an EarCheck monitor for review, but I was in other no way compensated for this giveaway. All opinions included in this post are mine and mine alone.